Reporters generally don’t clap at the events they’re covering, largely to remain impartial. It’s particularly true for South Korean reporters who usually maintain a calm, if not stoic, attitude at official events, no matter how big. But a rare moment occurred on Friday. 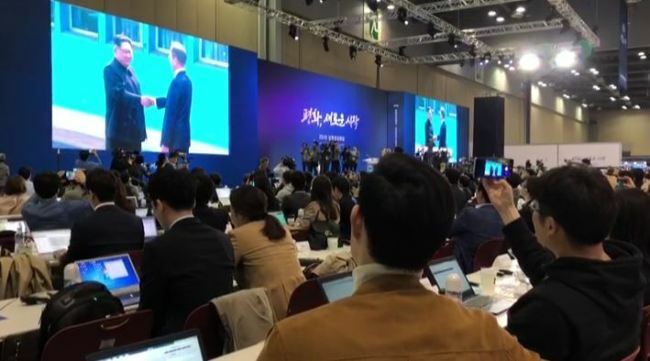 Local and international reporters gathered at the main press center set up in an exhibition hall in Goyang, Gyeonggi Province, erupted into a heartfelt applause at the historic start of the first inter-Korean summit in 11 years. The clapping began when North Korea’s leader Kim Jong-un appeared at the border village of Panmunjeom, and climaxed with Kim crossing the border at 9:29 a.m. to shake hands with South Korea’s President Moon Jae-in. The room erupted into a flurry of cheers and camera flashes, with some even giving a standing ovation at the sight. After posing for photos at the South’s side of the border, Kim invited Moon to step over to the North’s side for an additional picture, leading the crowd into another applause. Nearly 3,000 journalists from around the world have filled the main press center, to cover the inter-Korean summit taking place at the southern side of the truce village of Panmunjeom.